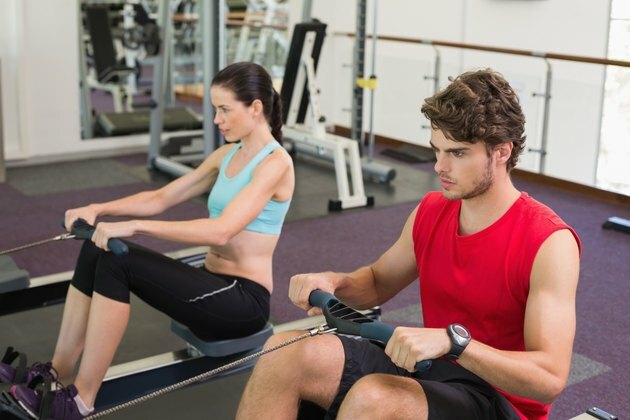 Is a Rowing Machine for Strength Training? Rowing machines don't offer enough resistance for strength training; instead, they're an excellent tool for building cardiovascular fitness. If you're looking for a strength-training workout, aim for a row machine instead. The difference in terminology may be minute, but it makes all the difference in the world. A seated row machine -- as opposed to a rowing machine -- uses a weight stack or weight plates to work your back, shoulders and arms. A rowing machine -- also known as a row ergometer -- works every major muscle group in your body rhythmically for an extended period of time. That's practically a textbook definition of the ideal cardiovascular workout. Better yet, a row ergometer is low-impact -- so you don't have to endure repeated pounding on your joints -- and the element of back flexion and extension in a proper rowing motion helps build core strength. As for the seated row machine, almost every gym has at least one variation on it. This basic strength-training machine features a padded seat, a chest pad you lean forward against and one or more handles you pull back on, "rowing" the weight toward you. Some gyms will also have a T-bar -- the free-weight equivalent of a seated row -- in the free-weight room. To use a T-bar you straddle the stem of the "T," bend forward from the hips, grasp the handles -- which form the crossbar of the "T" -- and pull the weight up toward your body. What Workout Machines Work Your Back? What Muscles Do T-Bar Rows Work?